Knowing how to make friends comes naturally to some children. However, others really struggle. 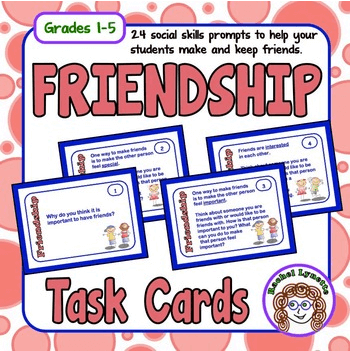 These 24 friendship cards can help those struggling students to learn social skills that will help them to make and keep friends. Use them as discussion prompts in small groups or as writing prompts. Another idea is to combine the two by first having students answer the question on the card in writing and then discussing responses. These cards are offered for free because I feel that social skills are so very important in the lives of children (and adults!). Please share them with your friends and colleagues. Even one friend can make a world of difference in the life of a child. 20 Back to School Writing Prompts Teach Your Students to Set Their Own Learning Goals and Boost Learning Fold the Line Goal Setting Steps for Writing Ideas for Using the Book Have You Filled a Bucket Today?